Use the drop-down menu below to explore Kos. Close to the Turkish coast and one of the most popular of the Greek Islands, Kos is relatively flat with one mountain range, Dikeos, rising to 846m. Boasting picturesque traditional villages, ancient sites and popular resorts Kos holidays are fantastic for sun-worshippers. Of the 12 Dodecanese islands, Kos is the third largest in size after Rhodes and Karpathos, and has the second largest population. Close to Turkey’s coast and fringed by beaches, it boasts charming villages, ancient historical sites, popular resorts and lively nightlife. 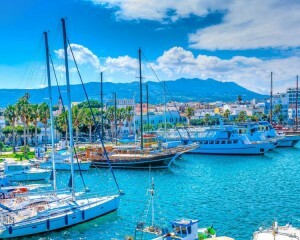 One of the most popular of the Greek islands, Kos enjoys Mediterranean sunshine, warm Aegean waters and fabulous beaches. Kos holidays are for beach-lovers, with an island most famed for its beaches; ranging from the long golden sandy beach in Kamari, the bustling beach at Kos Town lined by restaurants and bars, to the tranquil black volcanic beach with a few tavernas at Agios Fokas, and the family friendly gently shelving beach at Mastihari. Kos is fabulously located and you can island hop and discover the volcanic island of Nissyros, the stunning sponge island of Kalymnos as well as neighbouring islands such as Pserimos, Leros and Telendos. We sell a wide range of holidays to Kos and its stunning neighbouring islands so why not pop in to one of our branches or, call us on 01625 855855 as we'd be delighted to help you. Kos enjoys beautiful sunny days and a warm year round Mediterranean climate. The summer months enjoy particularly hot temperatures whilst the winter months are much milder. Getting to Kos is simple with many major airlines, including some "low cost" airlines, flying in from a number of regions across the UK and Ireland.